The surge of the adrenaline, the smell of the vaseline, the shine of the silver foil blanket. It must be London Marathon time! 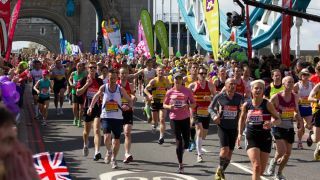 26.2 gruelling miles around the streets of the UK's capital city, it's one of the world's most famous long-distance road races and thankfully getting a 2019 London Marathon live stream is a heck of a lot easier than trying to compete in the thing. No gold medals for guessing where the London Marathon is being held - the world famous race takes in an exhausting 26 miles and 385 yards (that's roughly 42.2km in new money) of London's most famous streets and landmarks. And the 2019 edition is likely to be one of the most watched in recent years, thanks to the presence of one Sir Mo Farah. Yep, Mo's back again. But with the fastest marathon time of 2hrs 1mins 39secs set by Kenyan Eliud Kipchoge in Berlin last year, he's the one to watch. Will it be misery or the Mobot? Either way, TechRadar will tell you how to live stream all the Marathon action. We've got your UK and US watching options covered in this article. But if you try to watch the 2019 London Marathon and you're abroad, you're going to be out of luck - coverage will be geo-blocked. Luckily, there's an easy way around even this hurdle. Simply download and install a VPN to change your IP address to a server back in your country. That way, your laptop, mobile or streaming device will think it's back at home and thus the geo-block will be avoided. Lovely! Once you've got your VPN of choice installed, hit 'choose location' and select the appropriate country. It's super easy to do.